As VP of Technology, Eric Decker guides Firstborn’s development teams through technical challenges large and small, identifying thoughtful solutions to client problems. This approach has led to unique and award-winning digital executions for clients such as Mountain Dew, S&P Global, Supercell and HBO. A thoughtful commentator, Eric has presented at industry conferences like FITC and written bylines for publications like LBBOnline. 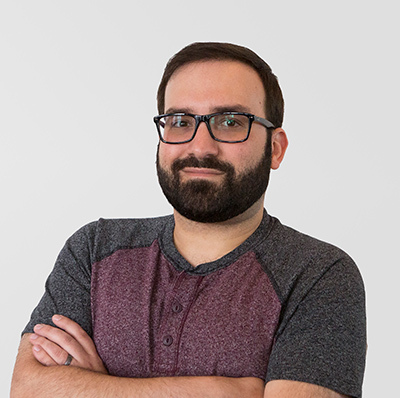 Eric graduated from the Rochester Institute of Technology's New Media Design program and began his career at Firstborn as a Flash Developer during the microsite golden era. Since then, his role has evolved and expanded with Firstborn’s growing technology and development practices. He has helped led the creation of digital platforms and solutions like brand dot-coms, mobile applications, out-of-home installations, and VR experiences. He’s a part of Firstborn’s in-house craft brewery, and lives in Brooklyn with his wife, one-year old daughter, and too many cats.